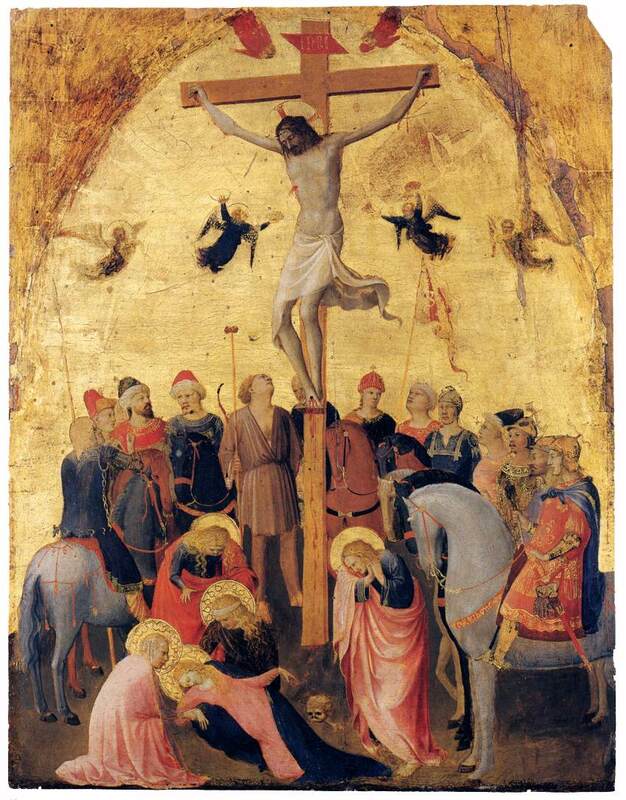 Fra Angelico’s Crucifixion shows the man to the right of Christ holding a stick with a sponge dipped in sour wine on it. I’m often asked by people how I manage to cope with looking at such a grisly subject on a daily basis. The truth is, I’m not sure. In one sense, the benefit of a safe historical distance from the subject makes it easier, but there are still very tragic and very human stories at the centre of everything I study and it can be hard carrying that information around with you all the time. This sense is most heightened when something resonates with my subject matter in the news, as it did this week. The week’s news was dominated by the impending Labour Party conference and the apparent ‘huge test’ that Corbyn faced. As an aside, It is fascinating to watch the media networks try to package, pull apart and denigrate a man who (whatever your thoughts on his policies are) is essentially just a well-mannered, considerate older man. If Corbyn has taught people anything, in his two weeks in power, it is that refusing to Kowtow to the media’s agenda (both left and right) leaves them at a loss for what to report. However, despite all the fanfare, bombast and doom-mongering around the speech, it was actually a little reported part of his address that caught my attention. It is not my intention here to detail the minutiae of the case of Ali Mohammed al-Nimr, but there are a few salient facts worth mentioning. Firstly, at the time of his arrest Ali was 17, meaning under UN Convention he is not allowed to be sentenced to death. Despite this, Ali has fallen foul of a Saudi Arabian law that allows execution of under-18s if they show physical signs of puberty.¹ Secondly, the reality of his sentence is truly horrifying. Under the terms of his sentence he will be crucified. This is not quite the same as the punishment Christ faced as the victim is first beheaded and then his body hung on a cross in a public space for passers-by to witness. A truly awful spectacle. When cases like this play out in the media it shines a very stark light on the stories I study. Something in Ali’s case jogged my memory of a story I had encountered. It is slightly outside of my period but within my region and so I returned to it to assess it in more detail. The case I refer to is that of Andrew Mills. I first stumbled across Andrew Mills in a fascinating and macabre book by Albert Hartshorne, entitled Hanging in Chains. Written in 1893 (59 years after the practice was ended in 1834) the book details instances of its use across England and interestingly, the Preface nods to the same emotional detachment from the subject matter, as I advocated above. Removed, as we happily are by time, from a period when it was lawful, and even accepted as fitting, that men who bore the brand of Cain should be made the subject of a revolting and disgraceful spectacle, we can approach the matter without prejudice, and with proper calmness. Some would argue that this emotional detachment is a chimera and an impossibility. This is particularly valid for the current historian as it is nigh on impossible in todays interconnected world to achieve Hartshorne’s illusive calm detachment from the brutality of a punishment when instances of it are just a news click away.In his tome, Hartshorne details the case of Andrew Mills, but before discussing Mills’ story it is important to provide the following caveat. The few available accounts of Mills’ case were mostly written one or two centuries after it occurred and as such make reference to the difficulty of sifting through the myths that surround the story. In their account of Mills the Monthly Chronicle of North-Country Lore and Legend (1887), warns readers of the numerous embellishments current in the popular understanding of Mills’ story. Resting on a firm basis of fact, it has, however, been covered over by fiction till the original elements of the story are scarcely discernible among the contributions of time. an effort…in carrying down the pitiful story, to dissipate some of the clouds of mystery and fable that have clustered around the Gibbet. The servant lad, the Andrew Mills aforesaid, was reckoned quiet and inoffensive, and was credited at the same time with deficiency of intellect and a partial derangement of that which he had. She humoured his fancies, and seldom tried to irritate him, as the others of the household and casual visitors would sometimes do. but it was clear that even she was sometimes witness to his violent fits of temper. although quiet when alone, he was wild enough when in anger, and when in a mood a dangerous light flashed from his usually dull eye. On one late January evening in 1683 it appears that Mills’ temper got wildly out of control. The Brass’ parents were out of the house for the evening attending ‘neighbourly festivities’ and on their return they found all three of their children murdered. An account appears in a Durham residents diary. A sad, cruel murther committed by a Boy about 18 or 19 years of age, nere Ferryhill, nere Durham, being Thursday at night. The manner is by report:- When the Parents were out of dores, a young man, being Sone to ye house, and 2 Daughters, was kil’d by this Boy with an axe, having knockt ym in ye head, afterwards cut their throats; one of ym being asleep in ye bed, about 10 or 11 yeares age; the other Daughter was to be married at Candlemas. After he had kil’d the Sone and the eldest Daughter, being above 20 years of age, a little Lass her sister, about ye age of 11 yeares of age, he drag’d her out of bed and kil’d her alsoe. This Andrew Millns, or Miles [Mills] was hanged in irons upon a gybett, nere Ferryhill, upon the 15th day of August, being Wednesday this yeare, 1683. There are several conflicting tales of what happened next, from Mills’ staying with the bodies of his victims to versions claiming he attempted to flee and was captured in the village. However, it is his punishment that is of particular interest here. Mills was sentenced to be hanged and then Hung in Chains. He was hanged at Dryburn, the site of execution in Durham pre 1811, and his body was hung in chains at Ferryhill near the scene of the crime, as was customary with gibbeting. However, as with most cases of gibbeting that was not the end of his story. In his book on Hanging in Chains, Hartshorne notes a common misconception surrounding Mills’ gibbeting. we have a story from Durham, showing that one Andrew Mills, gibbeted alive in 1684, for murdering his master’s three children, was kept in existence for some time by his sweetheart ( of course), who, until she was prevented, gave him milk in a sponge at the end of a stick. Now, as Hartshorne goes on to point out, there are several major flaws with this account in which Mills is gibbeting alive, but what interested me was the imagery. There are echoes of the crucifixion of Christ here. (see the opening image of this blog). About the ninth hour Jesus cried out with a loud voice, saying, “ELI, ELI, LAMA SABACHTHANI?” that is, “MY GOD, MY GOD, WHY HAVE YOU FORSAKEN ME?” And some of those who were standing there, when they heard it, began saying, “This man is calling for Elijah.”Immediately one of them ran, and taking a sponge, he filled it with sour wine and put it on a reed, and gave Him a drink. The poor sinner was suspended alive-that day after day, as life ebbed fast and hunger grew keen, his cries of agony were heard for miles adjacent, till the people about Ferryhill and the neighbouring hamlets abandoned their homes, unable to bear his piteous wailing, and only returned when death had silenced his voice and assuaged his sufferings. We can never be entirely sure of the truth, but given the fact that Mills was first hanged and then gibbeting, it is extremely unlikely that he would’ve still been alive. Again Hartshorne offers a useful suggestion here. Albert Hartshorne, Hanging in Chains. (New York, 1893), 96, http://hdl.handle.net/2027/uc1.b000728168. Betwixt Tudhoe School and Ferry Hill, there stood an oaken post, very strong, and some nine feet high. This was its appearance in my days, but formerly it must have been much higher. It was known to all the country round by the name of Andrew Mills’s ·stob. We often went to see it, and one afternoon, whilst we were looking at it, an old woman came up, took her knife from her pocket. and then pared off a chip, which she carefully folded up in a bit of paper. She said it was good for curing the toothache. Charles Waterton, Naturalist.,” Monthly Chronicle of North-Country Lore and Legend 2, no. 20 (October 1888): 451. So, what can we learn from the Mills story. Well, if so tragic a story as Mills’ is played out in Saudi Arabia, then the authorities should take a warning from history. As with so many public displays of punishment far from being remembered as the site of justice being enacted, they become the seat of myth making and legend and the act and the crime become subservient to the legend of the victim. Gibbets, crosses, gallows and all forms of public punishments often become a centre of mythologising as with the case of Andrew Mills – the County Durham’s Christ. Human Rights Watch, World Report 2011: Events of 2010 (Seven Stories Press, 2011), 580. My girlfriend’s father, a frequent reader of the blog and all round lovely man (hi Marcus!) sent me a fascinating link this week. It was a TED talk, which are invariably stimulating, given by Frances Larson on the public fascination with beheadings and its historical context. Her talk touched on several areas that I have previously blogged about, from the introduction of photography at an execution to the publics underlying fascination with the spectacle of death and violence. His suggestion has also led me to start my Christmas list early and top of it is Larson’s book, Severed – A History of Heads Lost and Heads Found. After 18 months of trying to find the perfect balance between my two preoccupations (comedy and a PhD) I think I have finally struck it. My comedy group are less than two weeks away from filming our latest project called Storydweller (a sitcom about a man who can enter the books he reads). We have managed to get some great comedy actors on board including Steve Oram (Sightseers and Ahhhh!) and Gabby Best (Top Coppers and Funny Woman Winner 2012). 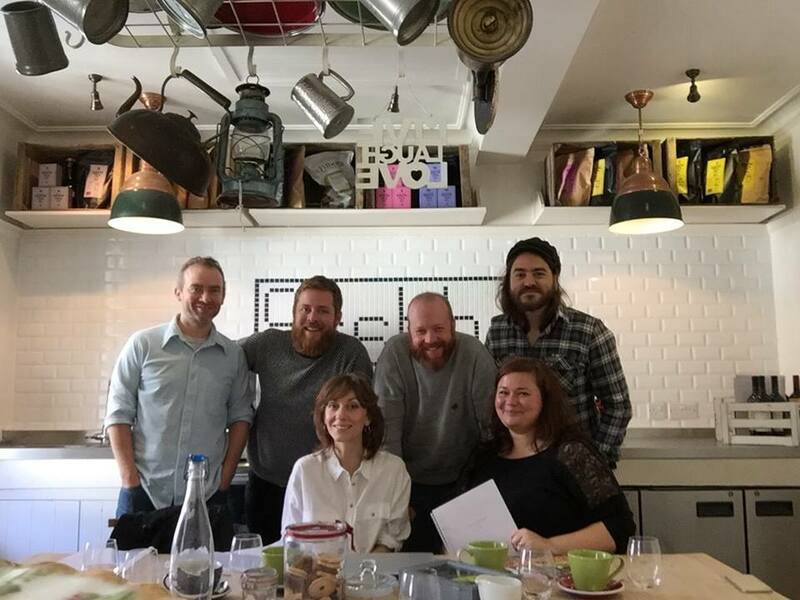 On Tuesday we drove to London to meet them both and the fantastic Director (Jacqueline Wright) to do a read through. In the build up to the meeting we had some last minute adjustments to do and at one point required a funny book title for a character to mention. We racked our brains, but came up short and then I suddenly thought, why make one up, I’m surrounded by books that no-one would believe existed. Within seconds our problem was solved – Through England on a Side Saddle by Celia Fines. For the eagle eyed readers of this blog, you’ll remember Celia as the woman who recounted her visit to the Newcastle Barber Surgeons Hall in the late 17th.